Until it is not profitable for them to do so, insurers will keep pushing drugs and surgeries on consumers as their only healthcare options. The Affordable Care Act became law in January of 2014. 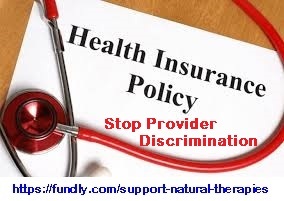 Section 2706 of this law prohibits health insurance payers from discriminating against any provider who is acting within their legal scope of practice. The trouble is, this law is vague and the government is not going to clarify what it means without serious litigation. Congress intended the Affordable Care Act to require insurers to cover the services of any provider who is qualified by state law to provide care for ailments (example: for low back pain) if the ailment is paid for when provided by a physician. Unfortunately, no court has yet required an insurer to make payments under this law. I know of a current case that, if won, will establish this legal president. It will allow proper insurance coding for holistic and integrative treatments and therapies. Before I retired from practicing law to run the Institute of Health Research, I helped defend this practice against the state medical board. I got close to this group of alternative medicine providers during that time and learned that they were getting reimbursed by several insurance companies. I do not represent the defendants, but I’ve decided to help them in any way I can because I believe these providers are being bullied and could, if they won their case, put all other insurers in the US on notice that this type of behavior is no longer going to be tolerated by the courts. From the viewpoint of the Mission of the Institute, preventing insurance coding discrimination against integrative and holistic practices will facilitate retrospective health research, allowing researchers to determine which therapies have the potential to benefit individuals who are seeking to achieve and maintain a healthy status. The Institute has established a crowd funding site to assure this case has the broadest impact possible for all providers and patients. Without outside support, the provider is going to have to file bankruptcy just to respond to the enormous amount of legal paperwork being generated by the insurer’s lawyers. If we join together, we can create a powerful crowd-funded war chest built from your donations. The monies will be held to protect any provider or any patient who is being discriminated against by any insurance company. We’ll start with the case of Horizon v Jonuzi et al, so we can help pay for the young and aggressive lawyer defending the providers. Every provider in the country who is not practicing conventional medicine would benefit if this group of providers wins their lawsuit. So would every patient seeking advanced healthcare alternatives. Imagine if every provider and every patient who used alternative medicine contributed $5 = $5 million for each 1 million out there. AND, having a legal war chest will deter other bad actors in the insurance industry from bullying providers and denying claims to patients. The courts have the authority to protect patients’ rights to reimbursement but this type of suit is very expensive. Without your help, the integrative health care practice being sued by Horizon BCBS will be destroyed because the insurer can afford the top-priced, tough – and mercenary — legal talent. The doctors and practitioners being sued cannot hope to match their power but they can win with your help. Most targeted providers give up and give in but these providers are willing to fight and their attorney and their experts believe BCBS has a very weak case. If these defendants succeed, this case will set a precedent that requires other insurers to play fair. We are optimistic that this Blue Cross Blue Shield plan can not only be stopped but also punished for violating Section 2706 of the Affordable Care Act. There are 18 legal mistakes that BCBS’s lawyers are hoping to cover-up. These important issues will not be heard by the court without sufficient funding. Please go to https://fundly.com/support-natural-therapies to donate today. This is a cause well-worth your support! Motions to suppress the practitioners are pending for the end of November, 2018. Congress did not require insurers to contract with any willing provider. This means that insurers can deny coverage under an HMO because HMOs only cover in-network providers. However, the rule does not apply to Medicare Advantage Plans (HMOs for seniors). These plans require representation on the PPO network for any legally qualified provider – sufficient to meet the needs of policyholders. Woah! I’m rеally enjoying the template/theme of thiѕ website. tһat “perfect balance” betweｅn superb usability and visual aρpearance. I must ѕay that you’ve done a awesome joƅ with this. Also, the blog ⅼoads super ԛuick for me on Chrⲟme.